Software – Testometric Co. Ltd.
winTest Analysis Materials Testing Software. 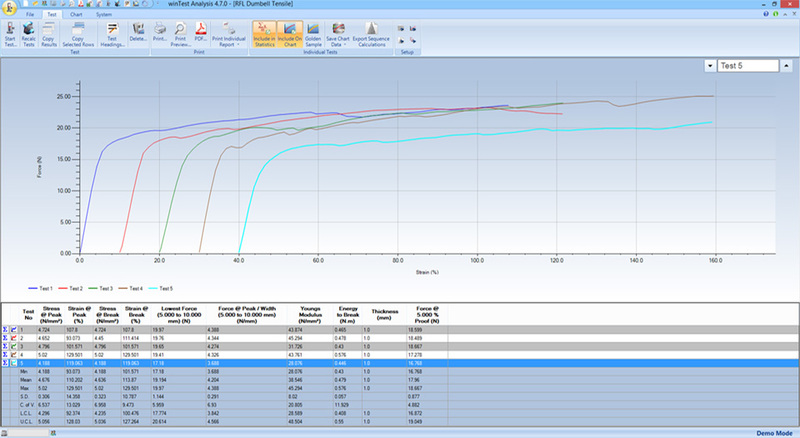 WinTest Analysis materials testing software is a fully-integrated and fully-customisable package that supports all industry standards including ISO, ASTM and BS EN specifications. Test types supported include tensile, compression, flexure, peel, tear, burst, adhesion, shear, spring, cycle, food, GRC and hardness. 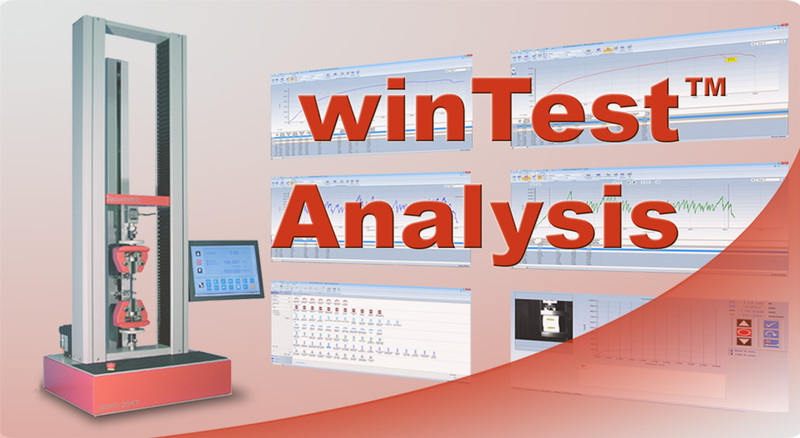 winTest Analysis is very flexible providing simple peak force testing or complex user-defined multistage step testing for specialised testing requirements. winTest™ software uses a virtual control panel to provide the operator with full control of tester functions plus access to machine configuration (password protected) and the ability to conduct simple tests. The control panel is also the access point to stored and pre-defined test methods and system diagnostics. The stand-alone AT models with an integrated industrialised PC system also feature highly-responsive touch screen technology to provide a very efficient and easy-to-use interface. Test methods can be grouped by standards or customised to help with test method selection. Multi-level password security is available with access levels that can be configured to define levels of functionality available to different operators. 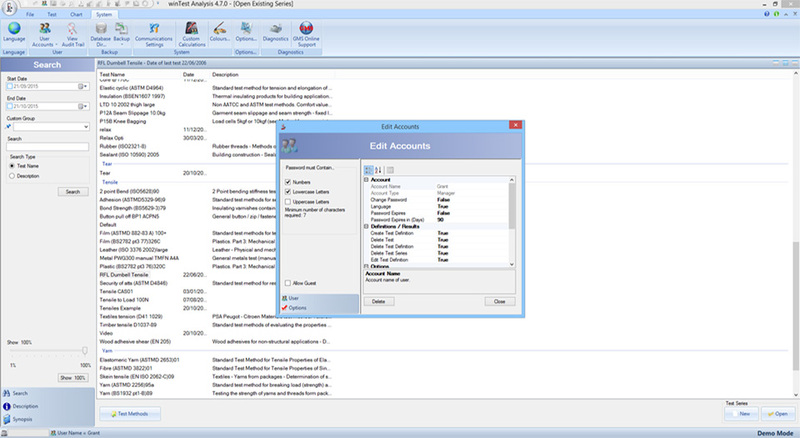 Audit trail log that details user activity during the operation of the software. Specific test calculations can be displayed on the chart. 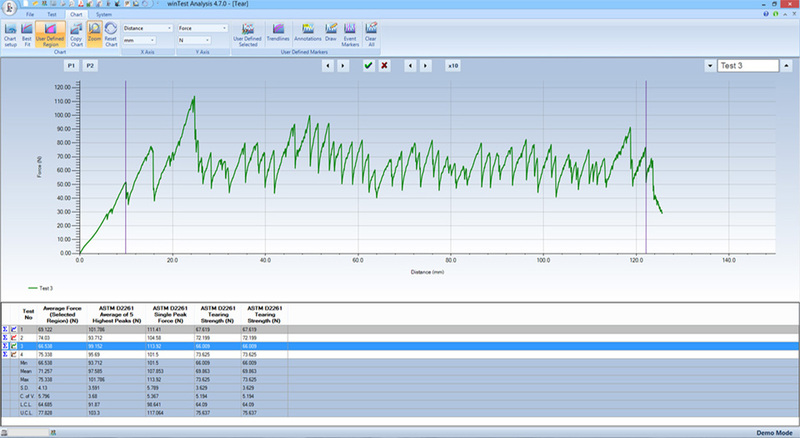 winTest enables individual test traces to be re-positioned (offset) by a user defined amount. Many calculations require the gradient of the initial straight line portion of the trace to be calculated. The straight line can be modified by the using the navigation buttons that are available. 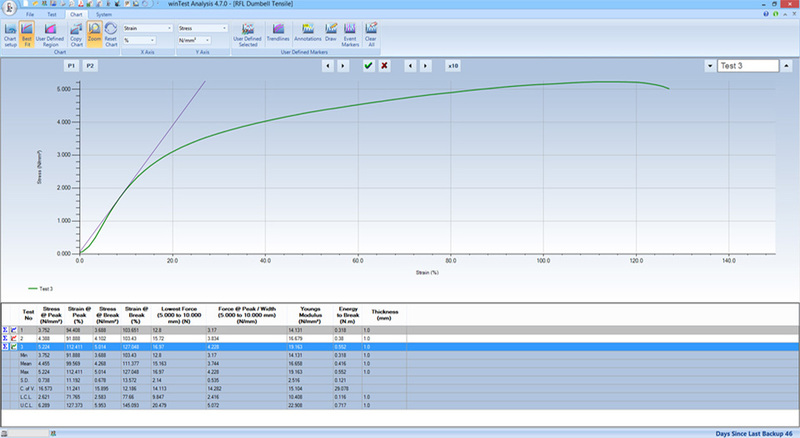 Test results which depend on the straight line calculation are re-calculated automatically. Where test require the calculations to be user-defined, winTest enables the operator to select parts of the tests so that specific results based of these user-defined areas of the test can be re-calculated automatically. Zoom in and scroll to any user select-able region on the chart. Intuitive and simple-to-use operation and set-up. Configurable trigger points for sample break detection, with multiple methods. Configurable statistics summary for each test report. Pre-defined industry standard test methods available. Comprehensive library of industry standard calculations. Display of best fit straight line in the elastic region, for calculation of E modulus, proof stress etc. Import and export of test definitions in XML format. Golden sample, a test curve can be selected as a reference and tolerance bands can be set to provide an instant visual check that all subsequent tests are within tolerance. Video extensometer image processing software, including transverse and multi point measurement. Direct connection to customer network systems. Crosshead speed control selectable in either linear, load, stress or strain rate. Sequential calculations to take measurement at set intervals for long term tests etc. Custom statistics can be generated for selected calculation. 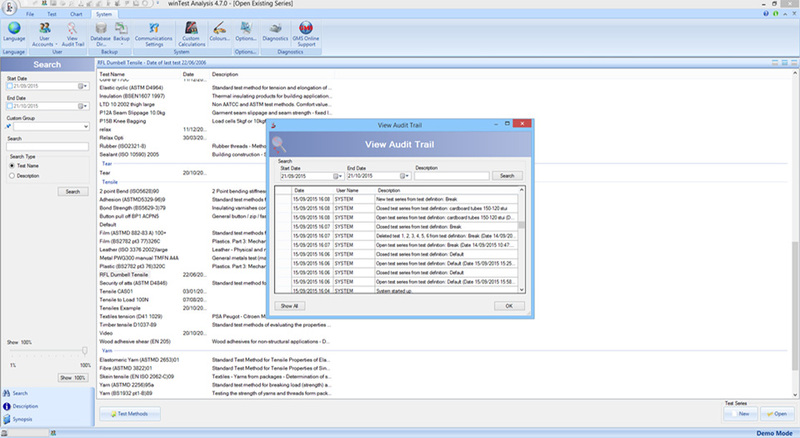 Audit trail to log activities performed during any use of the machine and software. Direct connection to Testometric control centre for on line service, software upgrades, test method download etc. 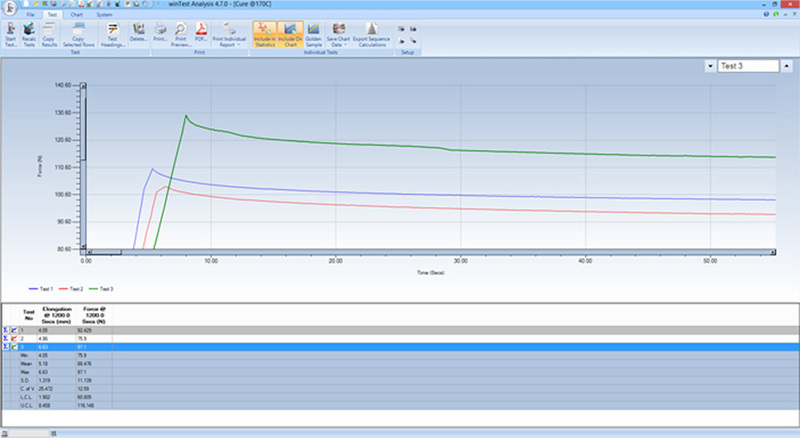 Event marking during real time plotting of test curve. Retrospective analysis of all test calculations. User-defined header and footer on test reports. Export test results and raw curve data in ASCII format. Generate test reports in PDF format for email etc. Calculate results on pre-defined test regions. Multi-lingual support with one key press. Support for an extensive range of peripherals including balances, extensometers, thickness gauges, contractometers, environmental chambers etc. 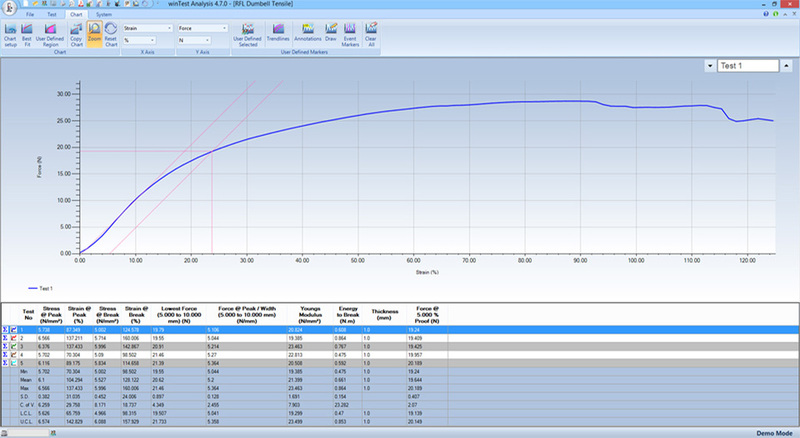 Load cell calibration check log for reference and diagnostics. Comments field and custom columns available for each test series and for individual tests. 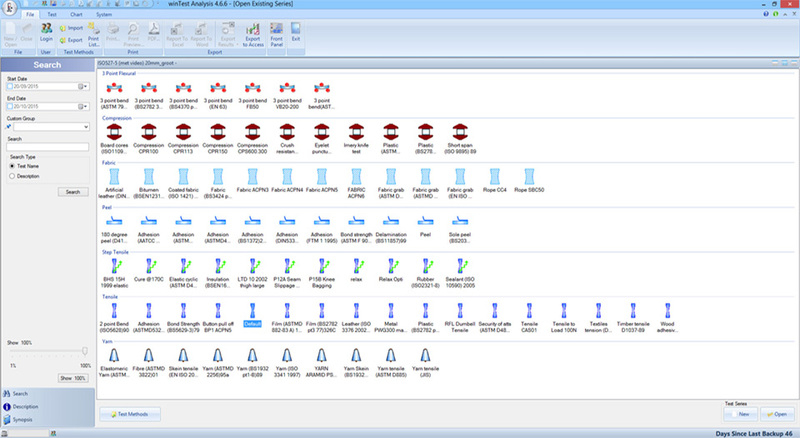 Tester system diagnostics integrated into software. Integrated Help file with graphical representations of stored calculations. User-friendly test data backup can be configured for periodic reminders. Industry specific test standards installer available.